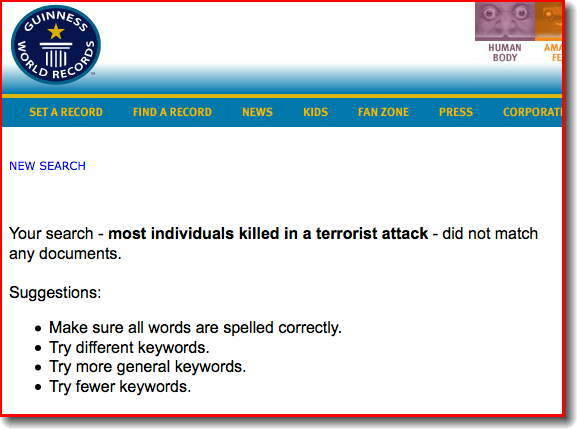 When Fail Blog discovered that the Guinness World Records website was challenging viewers to “Break the Record” for the “most individuals killed in a terrorist attack”, the blog’s editor did a screen capture of the outrageous website and posted it as a FAIL. No apology or “oops” from Guinness though for encouraging readers to “break the record” for the most individuals killed in a terrorist attack. One of our readers alerted us to this story and also discovered that Guinness has removed their webpage encouraging readers to break the world terrorist record. How is this relevant to anything, BFP? Are you losing it? Free press often print articles for fun. Different things. Thats why I like them. Robert we need more airplane articles! The item’s relevance is clear as day to me – as bloggers become more significant, their right to comment and even their civil liberties are under threat more and more as mainstream entities cringe being under such global vivisectioning. The power of blogs is in the fact that ANYONE can start one, no degree nor money just ‘Net and a laptop or computer. BTW – speaking of terrorists… On Mornin’ Barbados on TV8 recently, they visited the Codrington School and they had a feature where these pupils, about ages 12 to 14, were allowed to choose their own topics for a project. The student added (sic) ‘…but they have family and jobs like everyone else…’ Comments? (Maybe) it’s like the helplessness palestinians kid feel when they wave their rocks in front of tanks.